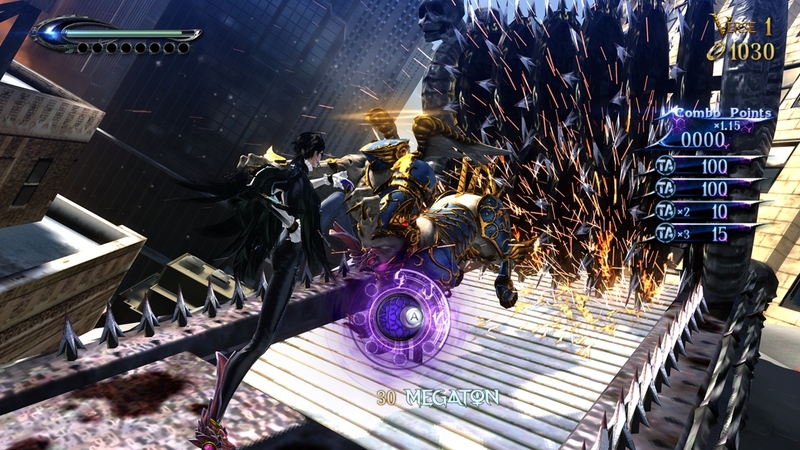 Bayonetta 2 Review: Is This the Best Wii U Game Ever? PlatinumGames are the go-to video game developers for the most over-the-top, mind-bending action games of the current era. Their first major contribution to the world of gaming came in the form of Bayonetta, an amazing Devil May Cry-esque action/adventure that was filled with personality. The Umbra Witch, we’re all embarrassed to admit we’re in love with, has gotten another go against her angelic rivals. Plus, she’s got a bone to pick with the demonic forces that give her some of her power. She’s back for more action in the Wii U exclusive, Bayonetta 2. Bayonetta and her hilarious band of allies spend a seemingly normal day together a few months after their first adventure. A quiet day filled with holiday shopping quickly erupts into an insane amount of ridiculous circumstances. We see Bayonetta fighting angles on top of super fast jets and moving trains, plus dealing with a disobedient demon on the side of a building. This mind-blowing sequence of events is merely the prologue, which should clue you in to just how much more insane this game becomes. Each chapter of Bayonetta 2 revs up the intensity and never lets up. For fans of the first game’s mechanics, there is so much more to love here. Bayonetta’s arsenal gets amplified and her moveset potential becomes unlimited this time around. Her hand/foot handguns are back, along with the newest additions of double katanas, a massive hammer and even a set of fire/ice cannons. 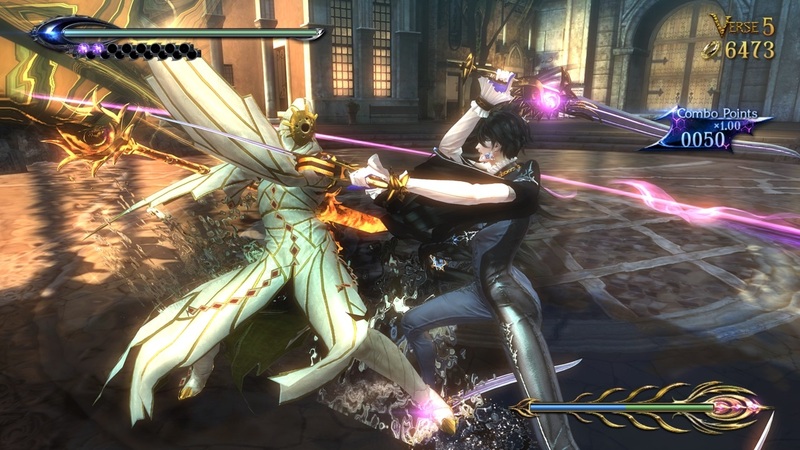 The intense combat sequences feature the familiar angelic enemies that game is known for, but a new batch of powerful angels offers fresher battles. The addition of demonic hordes also gives you a bunch of new faces to torture. Speaking of torture, Bayonetta still has the power to humiliate her enemies in satisfying ways. She can still dodge attacks the very last second and enter slow motion, plus she can still summon huge monsters to finish much larger foes. The brand new Umbran Climax ability makes the combat even more of a blast, as it makes Bayonetta unstoppable thanks to this mode’s more visibly powerful attacks. Each chapter introduces old and new enemies to exact your flashy combos upon. The plot itself is easy to grasp. Bayonetta foe-turned-friend Jeanne gets her spirit trapped in Hell, which leads to Bayonetta going on a journey to retrieve her soul. Along the way, Bayonetta joins up with old friends and runs into a magical young boy and a dangerous warrior with powers that rival her’s. The cut scenes are worth sitting through thanks to the abundance of risque body maneuvers, comedic lines of dialogue and well-crafted action sequences. The story here is just as crazy as you expected it to be. 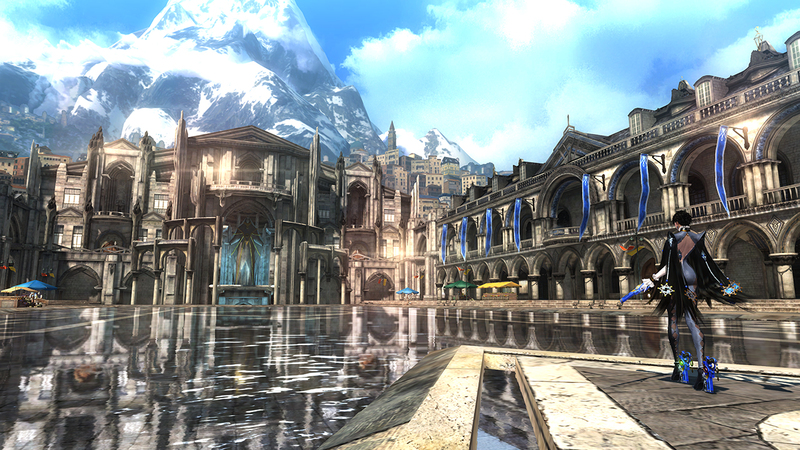 On a single-player level, Bayonetta 2 is a tight adventure that can be completed in 10-20 hours of play depending on your playstyle. Once you’re done venturing into the Depths of Hell, you’ll definitely want to return (crazy, right?). The replay factor here is off the charts, thanks to additional difficulty modes and the need to test out more of Bayonetta’s big moves. The amazing cosplay outfits that adopt the characteristics of Nintendo characters are actually worth taking advantage of. The multiplayer Tag Climax mode offers a ton of more content value for players who want to smash angels and demons together. Plus, you have an HD version of the first Bayonetta to dab into. There’s so much to enjoy here. Bayonetta 2 is the Wii U’s first masterpiece. The best elements of this game’s predecessor return and get that much better with a new offering of weapons, moves, modes and costumes. The hilarious yet still serious story, great mix of characters and abundance of video game easter eggs will appeal to everyone. Bayonetta 2 is a must buy.